It’s only when you decide to blog on a regular basis that you realize just how boring your life truly is. Example: right now I’m watching Star Trek The Original Series and contemplating smoothie bowls. I like smoothies. They’re about the only way I can manage to consume my vegetables (that’s a story for another post). You can easily drink them, and they’re just pretty great. However, lately I’ve been seeing pictures of smoothie bowls popping up around the internet. These things baffle me. Sure, they’re pretty to look at, but they almost seem to defeat the purpose of making a smoothie. Instead of a drink you can take with you, it’s a bowl that you have to sit and eat. That’s weird, right? So, as you can see, I’m thinking very deep thoughts. 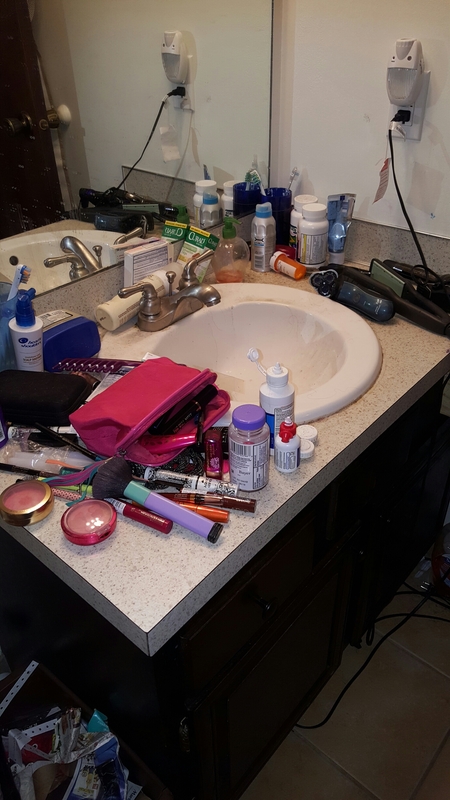 This is how our vanity usually looks. The problem is, our master bathroom is less suite and more dorm. Translation: it’s small. Almost claustrophobic. When the boy was a bachelor, the bathroom was fine. 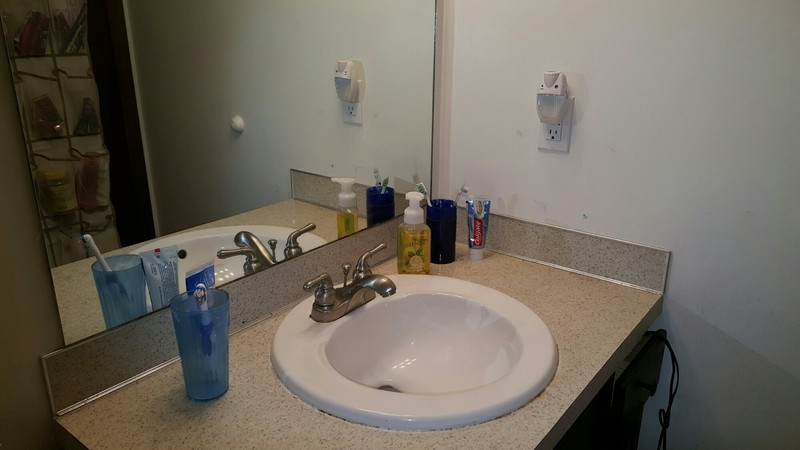 He didn’t need much counter space; just enough to put soap and a cup. Then he married me and discovered that unlike himself, I needed loads of counter space. I needed everything, readily accessible, all the time. Mostly, he’s been a good sport about it, but as we near the two year mark I can tell that the disaster that the counter has become is definitely an annoyance. Which led to me trying to come up with a solution. 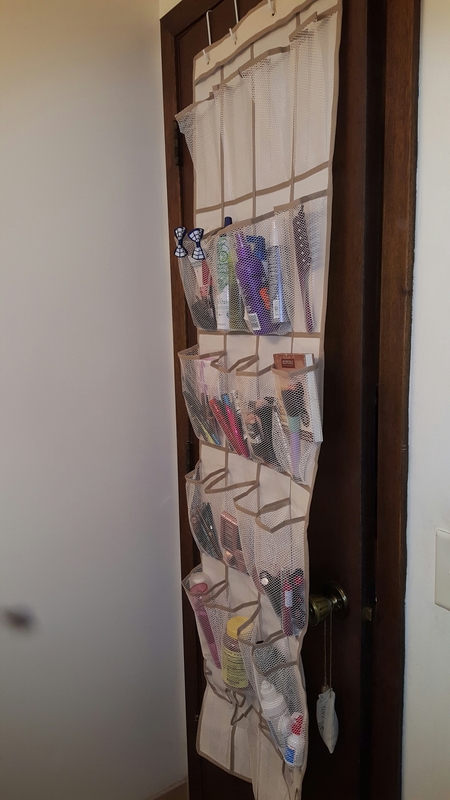 A shoe rack was the answer. It works so perfect and I can’t wait for the boy to get home from work so he can see the improvement to our counter! Life’s not perfect, but I’m so thankful for the ability to fix some of those imperfections. I was so scared. The depression pit I had been fighting all year wasn’t a new abode for me. Sure, it’d been a few years since I’d last gotten trapped there, but at least I knew I’d eventually escape. However, the feeling that all hope, even the hope that I’d eventually feel hope again, had been used up. Suddenly, the depression pit was a lot deeper, darker, and scarier than it’d ever been. As November progressed I cried, a lot. Usually the tears were due to fear anout the future, but sometimes they were due to frustration or anger or exhaustion (or a combination of all of the above). The days drug by, and I felt completely immobilized by my depression and anxiety. Most days I’ve considered it a victory when I get out of bed. This last week, has been a bit less dark, and I’m slowly starting to feel like I might be able to pull it together. But I’m scared. I’m terrified that depression and hopelessness will suddenly rear up and drag me down into an even deeper and darker pit. So, I’ve set some goals for myself for this new year. Goals that, I hope, will help keep me from completely disappearing into the pit. I want to get healthy, mentally and physically for myself and for the boy. The poor, long-suffering boy who loves me so fiercly, and has been there holding on to me through all of this. 1. Make sure the dirty dish side of the sink is empty every night before I go to bed. 2. Up my water intake. I really want to try the gallon of water a day challenge, but I’m not sure I’m ready, so I’m starting by just drinking more water period (fairly easy considerimg I rarely drink water). 3. Rejoin the gym and go five days a week. 4. Leave the tv off for the better part of the day. 5. Practice flute, clarinet, and trombone thirty minutes a day five days a week. Practice trumpet and piano one hour five days a week. 6. Write for at least an hour five days a week. 7. Do one thing in the house that qualifies as cleaning or organizing everyday. 8. Limit consumption of soda/junk food/fast food. 9. When possible, eat one family meal a week at the dining room table with the tv off, instead of on the couch with the tv on. I feel that these are all things I can actually stick to, and hopefully with this plan of action 2017 will be amazing!